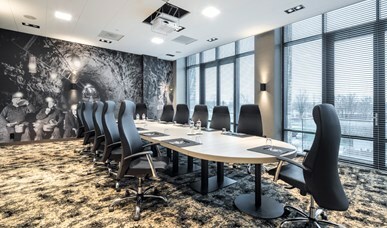 Organising a meeting in Hotel Heerlen ensures you of knowing exactly what you can expect. Whether you wish to organise a meeting, training, congress or a product presentation; Hotel Heerlen will ensure a success-experience. Our entirely new all-in meeting rates will leave you with a clear financial picture prior to your meeting, an open-plan layout with no obstructions. Our new all-in meeting packages include a room adapted to the number of people and including presentation tools. Our prices are dependent on group size and can be inquired by request. With the button above you can inquire a tender. Our 12-hour meeting package is provided with the same extended package as the 8-hour meeting package but is extended with a delicious 3-course business dinner included instead of an extra coffee break. Also included in this package is a late afternoon snack. *If you wish to use a beamer during your meeting, please indicate this while making your reservation. For a delicious lunch we offer the possibilities below or just contact us for more information. From Monday to Saturday we serve a lunch buffet in our restaurant starting at 12:00 until 14:00. Homemade salad with accessory dressings and other types of cold meat- and/or fish dishes. Pudding, yoghurt and seasonal fruits.